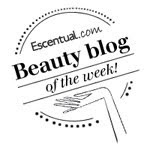 BeautySwot: Holiday Luggage - Spotting Your Suitcase On The Carousel! Holiday Luggage - Spotting Your Suitcase On The Carousel! I will admit it, I was until very recently one of those people that had to have matchy matchy holiday luggage and preferably in black,.but how many times had I stood at the luggage carousel with my husband and strained our necks wondering if the next black case out was ours ... The majority of cases coming round are either black or silver and I can't tell you how often I watched people pick up cases that were not theirs only to put them back on the carousel! Well this holiday my husband politely suggested that I may want to buy another case for myself (we have been through a few) as he was happily going to fill the large one we had.. the smallest was going to our 4yr old which left me without a case. Case shopping is not altogether that glamorous unless you are purchasing those gorgeous matching Louis Vuitton luggage sets but let's face it, they don't get handled with care so why shell out too much. Out we went to find a medium sized case and yes in my mind I fancied a black one with four wheels, the ones that can be pushed in any direction and spin round. I remember the days when my parents would have to lug our heavy suitcases about and we would watch in envy as the smart airline crew would pull along theirs on wheels, what a great idea we thought. Just as we upgraded ours to those ones with extending handles and two wheels we spot Japanese tourists with cases with 4 wheels in Hawaii and so the upgrades continue. I digress, I spotted this bright pink and blue, Hawaiian print case with four wheels and something just told me to buy it. 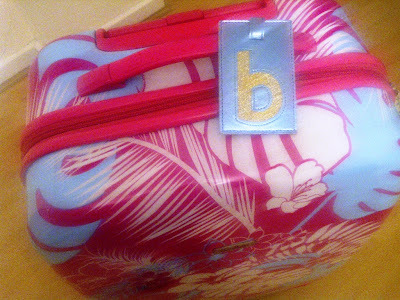 I added the blue Bombay Duck luggage tag with the letter B and off I went. I am not lying when I say it makes people smile when it comes round the carousel, they giggle and point, say it is such a great idea and the men smile or perhaps pity my husband ha ha! I have the last laugh though when mine is so distinctive and easy to spot. I have a bright lime green Benetton one that I picked up many years ago from TK Maxx, it's certainly not subtle but I have no trouble picking it out on the carousel - never seen another like it! And the other half was very good about the jibbing when he had to take it on a work trip! Exactly, these bright cases do the trick nicely!